Jeffrey Essmann’s Life on the List: Assorted Sordid Tales and Unsavory Relations is one of the hottest stories of gay erotica ever told. Jeffrey Essmann was a fixture on the New York downtown performance scene in the 80s and early 90s. His one-man show “Artificial Reality” was nominated for a Drama Desk Award, and he was featured in the video, “New Wave Comedy.” His cult hit “Triplets in Uniform” at La MaMa marked his transition to playwriting. In the early 90s Essmann left New York for Chicago, where he became a featured performer in a performance series at Steppenwolf and a regular contributor to the Chicago NPR affiliate. In 2005 he returned to New York, where his short piece “Johannes, Pyotr & Marge” was produced at the Humana Festival. His one-man show “Skin Deep” was commissioned for the 2006 HOT! Festival. “Skin Deep,” along with “The Usual Freak Show” at La MaMa a year later, marked his successful return to the New York theatre scene. He is currently working on a new play, The Indifferent Narrator. Life on the List is his first book. 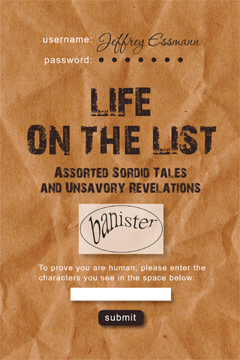 Life on the List is currently only available in eBook on Kindle Select. If you are interested in other formats, please contact info@fannypress.com.